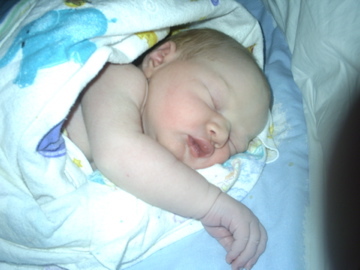 You are here: Home / Attachment Parenting / Pregnancy / I had my baby! I’m so sorry for the delay, but I’ve been a little busyÂ ;)Â I need to type up my birth story.Â I had an amazing, wonderful, fabulous waterbirth at home.Â My little girl is adorable.Â She was 8lbs even at birth and 21″ long.Â She’s a champion nurser!Â She’s been gaining 2oz a day for the past 3 days.Â My older two are adjusting really well. I have a few books that I REALLY want to write about, but I’m not sure when it’ll happen.Â I also want to add some pics of a few of my FO that I knitted during my break. Enjoy your babymoon! Hope to see you at playgroup when you are able!! Oh, my gosh! She is so cute and sweet and cuddly-looking!!! I can’t wait to hear the birth story. yay! wonderful! she’s so cute! congrats! What a precious baby. I’m glad to here that she and mommy are doing well. Rejoicing with you! She is sooooo precious.